Back in 2007, Val McClatchey had reportedly showed an amateur video taken from Berlin, PA to a group at the 2007 Shanksville memorial reunion that supposedly showed the aftermath of the alleged Flight 93 crash explosion and, thereby, "vindicating" her infamous "End of Serenity" smoke cloud photo. 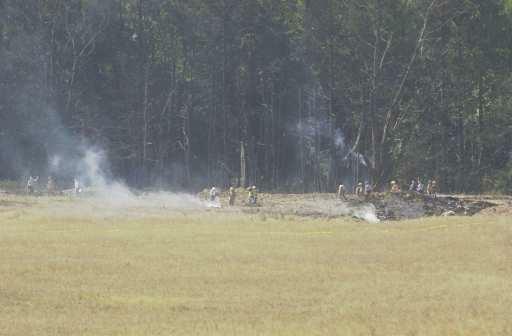 SHANKSVILLE — As the 10th anniversary of the Sept. 11 attacks approaches, a video shot just minutes after the crash of United Airlines Flight 93 has surfaced. While the video does not show the moment of impact, it clearly shows a mushroom cloud rising from the site of the crash at an abandoned strip mine near Shanksville. The voice of Berlin resident Dave Berkebile, now deceased, can be heard speaking calmly in the background. Dave Berkebile, now deceased, who shot video of the Flight 93 crash scene, is shown with his wife, Cathy. Val McClatchy of Indian Lake, who took the first known photo of the Flight 93 crash, watches a video shot moments after the crash. Donna Glessner, who is collecting oral histories for the National Park Service, saw the video and said she believes it is the earliest known video of the crash. “I thought it was just a very important historic piece,” she said. “No one else has a video of that smoke cloud.”At the time of the crash, Berkebile and his wife, Cathy, lived on Blue Bird Road. 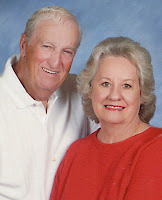 Although he passed away in February, his wife, who has since moved out of the state, spoke about events that day.She said a video camera was kept at easy access to shoot vistas from their home, which was situated on 40 acres. “My family lives in the city,” she said. “They had never seen the mountains. Up there on my mountain are the most beautiful sunrises and sunsets. Also snowstorms. Berkebile said their initial thought when they heard the explosion was that it was dynamite. Although the distance between their home and the crash site is 8 miles by road, it is just 2 1/2 miles by air and Berkebile said they had an unobstructed view of the skies above the crash site. Hello, I am Dave Berkebile's sister. Our two homes are the only ones on Bluebird Lane. I saw it was listed as Blue Bird Road in my morning paper. Yes, that was an exciting morning, When my home shook from the impact, I immediately called Dave and asked him if his house shook, He said yes, 'What was that?' I said it must have been an earthquake! Then he saw the smoke to the NW and said'Look out your big window!' I turned on my scanner and heard a large plane went down in Lambertsville, when he heard this he said'I'm going to see.' I left right after for the Shanksville School where I had two grandchildren enrolled. When Dave returned, he said all he saw was a big hole in the ground. Thank you . 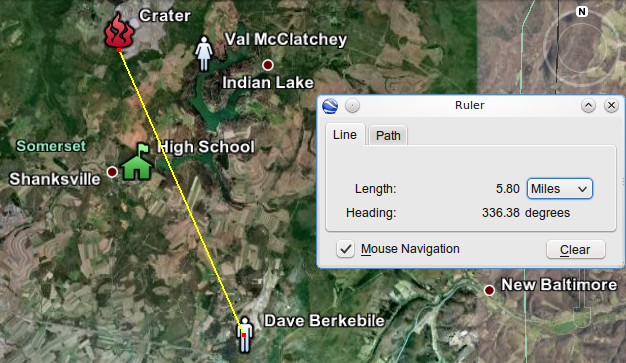 The article also says that the distance between the Berkebile's house and the crater is 2 1/2 miles by air, but according to Google Earth, the distance is about 5.8 miles. On the surface, the video does look consistent with Val's photo and the official story, so this should be enough to vindicate Val McClatchey's mushroom cloud photo, right? The video will be available at the crash scene’s Flight 93 National Memorial, which is being dedicated Saturday as part of the 10th anniversary remembrance of 9/11. Berkebile’s wife, Cathy, said her husband initially offered to show the video to news outlets covering the Flight 93 story, but no one was interested in looking at it. What? The media back then weren't interested in looking at a video of major historically significance??? Now that one is just a little too hard to swallow. Val McClatchey snapped the single picture with her new digital camera. "I didn't even aim. I was just like, 'Oh, my God,' " she said. She dropped the camera, jolting the battery loose, then tried in vain to call her husband, son and daughter. Next, you would think that this video was released by Mr. Berkebile’s wife, or other family member. Nope. Guess who of all people? Five years ago, [Mr. Berkebile] gave the 1 minute, 38-second video to Val McClatchey, the woman who shot the only still photograph of Flight 93’s haunting, skyward aftermath. McClatchey recently donated the video to the National Park Service for an oral history of 9/11. McClatchey recently donated the video to the National Park Service for an oral history of 9/11. She had endured years of harassment from conspiracy theorists who believe Flight 93 was shot down by U.S. military jets and that her photo was a fake. “We never considered it might be important (until then),” said Mrs. Berkebile. They never considered it might be important until then??? Did they not know they had the only alleged video of the smoke cloud? Apparently they did when earlier in the article Mrs. Berkebile said her husband initially tried to bring it to the attention of the media. - Mr. Berkebile supposedly filmed this about 6 miles away. The large smoke trail should have been able to be seen from at least double that distance, yet Val McClatchey and Dave Berkebile were supposedly the only ones who filmed the smoke cloud within a 12-mile radius. - The Berkebile's supposedly went to the "crash" scene immediately after Mr. Berkebile shot the video. He forgot the take his camcorder with him??? - We can't question Mr. Berkebile about his video because he "died suddenly" earlier this year in February and it doesn't help that he was a lifetime member of a Mason lodge. We also must question how could a large smoke cloud even form at all and I'm not talking about because I think no plane crashed there, but even according to the official Flight 93 crash story?! The way Flight 93 supposedly crashed was when it was on its side, or upside down (which ever official version you choose to believe), its wingtip hit first causing the 757 to begin to cartwheel. The plane's front end slammed down on the ground next causing the cockpit section to "break off" and shatter into the woods and field. The rest of the plane on back (one quote claiming 80%) then buried deep into the ground. - Veteran FBI agent Michael Soohy had been to airplane crash scenes before, and he thought he knew what to expect: chaos, bodies, a hulking wreck of a jet. "I don't think anyone expected to see what they didn't see," said the 50-year-old who grew up near Johnstown. "It's almost like a dart hitting a pile of flour. ... The plane went in, and the stuff back-filled right over it." And the 757 supposedly went in the ground so fast it didn’t have a chance to burn. And as that small section of forest that got fire damaged, the part of the plane that would have caused this was the snapped off cockpit section and I don't know what's in a 757's front end that would even cause an explosion. - Larry Williams, a retired Pa. State Trooper, was playing golf about 9 miles away from the crater when he saw a commercial airliner fly by and bank on its side until it dipped below the skyline. In his interview, he never mentions hearing an explosion, seeing a fireball or even a smoke trail. - Paula Long: “I never saw that smoke,” Paula Long, an eyewitness, told AFP. Long ran “immediately” after hearing the crash but did not see the cloud of smoke caught in the now-famous photograph by Valencia McClatchey, she said. - Unidentified female witness: "...and it was fairly low. It wasn't treetop low, but it was lower than it should have been. And like I said it was cocked like it had been turning to the left. And, just in a nose dive position once it cleared the tree tops I couldn't see it no more. And then when I got out to [Hwy] 30 is when I seen the big puff of smoke, and-- I even had thought to myself that there should have been more smoke than that whenever it crashed cause the jet was extremely big." And lastly, the color of the smoke plumes in both the Val McClatchey photo and Dave Berkebile video are reminiscent of grey-colored ordnance blasts, not black-colored jet fuel fires. I don't know about you, but I'm declaring shenanigans on this video.